A good friend of ours is a Costa Rica wedding planner and when she scheduled her own beach ceremony for November we thought she was nuts. Every bride wants everything perfect and she must have led a charmed life indeed because it turned out perfectly despite the fact that it’s one of the most unpredictable times of year. If you’re willing to roll the dice and maybe dance in the rain November can be perfect for a great trip around Costa Rica. 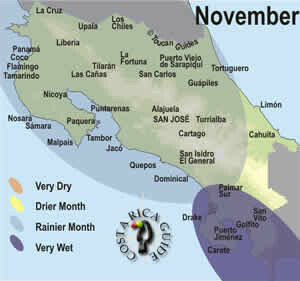 As the map shows typically November is one of the wettest months in Costa Rica but by the end it’s usually drying out. Weather in Costa Rica in November is a gamble. On average it’s a rainy season month on the Pacific and in the central mountains but sometimes (especially with El Niño) the dry season comes early. La Niña years typically have the opposite effect – intensifying and lengthening the rainy season. Typically, the northern and central beaches and mountains get significant rain some days, but enjoy a pattern of sunny mornings and days with most of the showers in the afternoon or evening. Early in the month the southern Pacific and Osa peninsula are still quite wet as the temporales del Pacífico continue. Lodges and tour operators that have shut down during the exceptionally wet months of September and October resume operations as the weather begins to dry towards the end of the month. The southern Caribbean side (Cahuita, Puerto Viejo and Manzanillo) is generally much drier, but as you move north towards Tortuguero the afternoon rains pick up. November is probably the least predictable month for weather in Costa Rica. For example in 2013 and 2014 it was like someone threw a switch in mid November and the sun came out to stay but severe flooding occurred in the southern Pacific in the second half of November 2015. Back in 2007 November was one of the rainiest months on record. Corcovado shut down because tourist we’re endangering themselves trying to rescue animals from trees in flood areas and the rangers could not patrol the park effectively. The record didn’t stand for long because in 2010 tropical storm Tomas dumped record rains that closed every major highway (including the PanAmerican) due to bridge collapses and mudslides for most of the month. Another seasonal weather phenomenon in November (usually later in the month) are strong winds especially in the northwest. These “Papagayo” winds are the result of cooler, dry air moving down from North America and displacing the moist, warm dense, tropical air mass. The resulting pressure difference causes high winds that are accelerated through gaps in the central mountain ranges and can exceed 100 kph. In November high temperatures in the lowlands and and near the beaches are in the low to mid-eighties (low to mid nineties are possible) and lows in the low seventies. As you move up to the Central Valley around San José both the highs and lows are 5-10 degrees cooler. By the time you reach the high elevations around cloud forest destinations like Monteverde and Chirripo the high temperatures are in the mid sixties to low seventies and it can be downright chilly at night. If you’re thinking about spending a holiday in Costa Rica Thanksgiving might be a good choice. It’s not a Costa Rican holiday so the kids are in school and their parents at work instead of heading to the beaches as is the case on Christmas, New Years and Easter/Spring Break. Few Ticos vacationing means less competition for the accommodation inventory and generally better availability and prices than at the other holidays. You should be able to wing it pretty easily in November, especially if you’re planning on staying in budget and mid-priced hotels that rely on walk-in clientele. All but the most popular resorts and lodges typically have same day availability in November and some even offer last minute discounts. The “green season” is winding down in November but low season prices and availability are in effect. Costa Rica’s meteoric rise in popularity means that the days of 50% off for low season are mostly a thing of the past, but you can still expect to save around 20% to 30% and it’s a great time to snag a reservation at some of the small boutique hotels that are booked solid months or even years in advance for the peak travel times. Airfare bargains are harder to find than you might expect for “low season.” Most airlines cut back on the number of flights and some suspend service altogether. Even though the demand is down, so is the supply of seats so prices tend to stay fairly stable. In our experience November has been the worst month for roads. There may well be more rainfall in the preceding months but by November the ground is saturated and a heavy rain often precipitates landslides that close roads for weeks and even sometimes months. In 2014/2015 the Pan American Highway south out of the capital was closed until March from washouts the previous November and December. November is a good choice for low season prices, but if the possibility of record rainfall seems like too much of a gamble you might consider pushing your vacation back to the first two weeks of December. Low season prices are still mostly available in early December and the odds of drier weather are better (definitely not guaranteed though – in 2017 rainy season weather patterns persisted through December well into January and even February 2018 along the central and southern Pacific). Another alternative is August, smack in the middle of the rainy season but more predictable than November. Instead of even odds of surprisingly wet or surprisingly dry like November, August is nearly always middle of the road with some rain especially in the afternoon and overnight but rarely a washout. If you decide to let the cards fall as they may and give November a try take a look at these tips on where and when to look for wildlife and the best activities this time of year. From 2014 through 2016 El Niño and La Niña (cooling of the Pacific Ocean) were taking turns causing wide variations in Costa Rica weather but neither one is predicted for November 2019. This year will be La Nada ENSO (El Niño Southern Oscillation – Neutral) which brings especially unpredictable weather. approximate exchange rate ¢624 per $U.S. Día de los Muertos – All Soul’s Day is observed across Costa Rica with Catholic masses and pilgrimages to graveyards. Coffee Picking Contests – Local communities throughout the Meseta Central and mountains sponsor coffee picking contests in November. El Desfile de Carretas – One of the largest parades of ox-carts (the other is the Día de los Boyeros the second week in March) takes place in San José the last week in November. Thanksgiving – Just like the 4th of July it has nothing whatsoever to do with Costa Rica but some of the restaurants and resorts have picked up on the idea and offer U.S. visitors a turkey (or some approximation thereof) dinner.